Kelly Lennon-Martucci, LCSW, Director of School Based Mental Health Clinics at Henry Street, was honored at the annual National Association of Social Workers 8th Annual Leadership Awards Dinner in December. 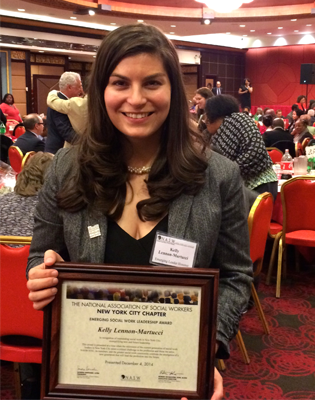 Kelly was named as an Emerging Leader in social work. The NASW Awards Dinner awards leaders in the profession including Emerging Leaders to recognize individuals who Sandy Bernabei, LCSW, the President of New York City’s NASW chapter, called “the creative and energetic social workers of the future. Kelly Lennon-Martucci joined Henry Street Settlement in 2012 and has brought the agency’s School Based Mental Health Clinics to five New York City public schools: PS 20, PS 140, PS 142, PS 134 and PS 137. The School Based Mental Health Clinics aim to eliminate barriers that prevent children and families from seeking mental health care by providing services on-site in schools, and collaborating with educational professionals who spend extended time with students on a daily basis. They are satellite clinics of Henry Street’s Community Consultation Center, the agency’s mental health care program, located 40 Montgomery Street.